In order to celebrate the great achievements accomplished by the late Dr. Heinrich Rohrer, Nobel Laureate and IBM Fellow and to further promote progress in research and development in the field of nanoscience and nanotechnology, an international prize was named after him in 2013 by The Surface Science Society of Japan (SSSJ) in collaboration with IBM Research – Zurich, the Swiss Embassy in Japan and his wife Rose-Marie. 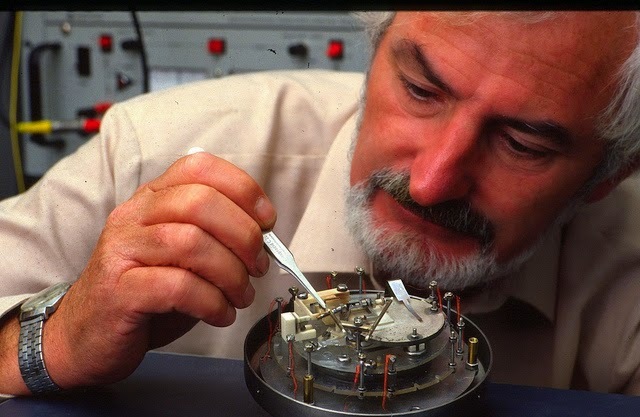 Dr. Rohrer was one of two inventors of the scanning tunneling microscope, which opened the world to nanotechnology. Heinrich Rohrer with the STM in 1986. 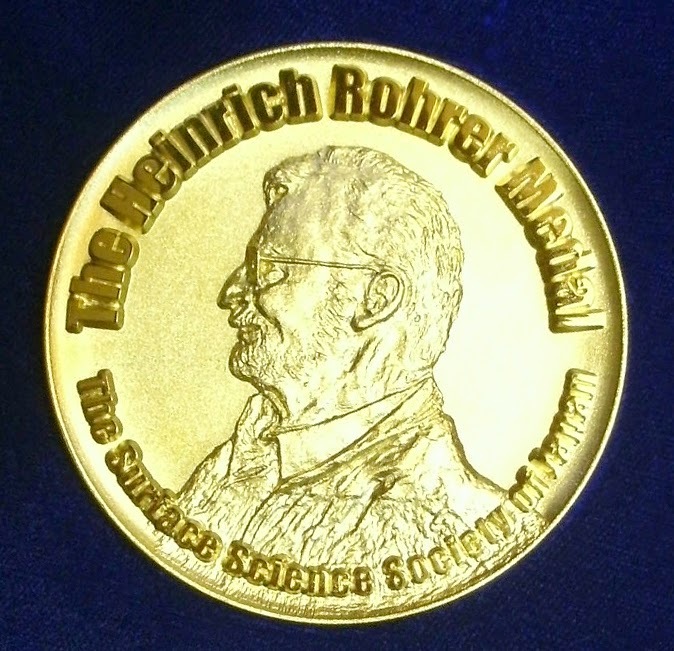 The Heinrich Rohrer Medal is composed of the Grand Medal, which goes to researchers who have made distinguished achievements in the field of nanoscience and nanotechnology based on surface science and the Rising Medal, which goes to researchers 37 years old or younger who have made outstanding results and are expected to continue to play active roles in the field. The Medal includes cash prizes and will be awarded every three years, at The International Symposium on Surface Science (ISSS) organized by SSSJ next scheduled in November 2017. The winner of the first Heinrich Rohrer Grand Medal is Roland Wiesendanger, Professor at the University of Hamburg, Germany for his pioneering and ground-breaking achievements on spin-resolved scanning tunneling microscopy and spectroscopy, bringing about very deep insights in spin-related properties of materials at atomic scale. The winners of the first Heinrich Rohrer Rising Medal are Yoshiaki Sugimoto, an Associate Professor in Osaka University, Japan for his outstanding contributions to manipulation and chemical identification of individual atoms using atomic force microscopy and Jan Hugo Dil, SNSF Professor in Ecole Polytechnique Federale de Lausanne, Switzerland for his leading and creative roles in identifying novel spin structures using synchrotron radiation-based spin- and angle-resolved photoemission spectroscopy. After receiving their medals last night in Japan they answered a few questions. Question: As simple as possible, can you please explain your area of research? Roland Wiesendanger (RW): The understanding of magnetism at the ultimate, atomic length scale is one of the current frontiers in solid state physics. It is a key to future applications in spin electronics and the highest density of magnetic data storage. Spin-polarized scanning tunneling microscopy and spectroscopy are powerful tools to access magnetic phenomena on a scale all the way down to the very atoms. During the past two decades a large variety of surprising magnetic structures were discovered by spin-polarized STM. Competing magnetic interactions effective at the atomic length scale give rise to unexpected ordered structures of great complexity in monolayers of magnetic atoms as well as in artificially created nanostructures built up atom-by-atom. Even the flow of spin-polarized currents through individual molecules could be studied with sub-molecular spatial resolution by spin-polarized STM. an attempt to create such nano-devices from the atomic or molecular level instead of miniaturizing from the macroscopic world. artificial nanostructures on surfaces by manipulating single atoms or molecules one by one. local characterization techniques using scanning probe microscopy (SPM). the spin of an electron that passes through the material in a controlled way and even to switch the magnetic state of a small magnet. Such effects and possibilities are very promising to use the spin of the electron instead of its charge to transport and control information, which is the aim of so-called spintronics. In our research we have been able to create a basic model of what determines the magnitude of these effects and we have found several materials with promising properties for spintronics. Question: What does winning this award mean to you? RW: As a young researcher working at the University of Basel in the 80s, I was greatly influenced by Heinrich Rohrer’s way of thinking. He always encouraged young researchers to find their own research topics guided by novelty and expected impact – “What would change if it could be done?” was one of the important questions raised him in order to force research activities into a meaningful direction. Right from the early days of the development of the spin-polarized STM technique I received strong encouragement by Prof. Rohrer which continued after I moved to the University of Hamburg. YS: I am honored to receive the Heinrich Rohrer medal. Winning this award means that the hard work that my co-workers and I have invested in this research is recognized and it is a strong motivation to continue line of work. I am too young to have had the time to directly interact with Heinrich Rohrer, but I am sure I will be speaking for many others when stating that the work he has done at the IBM Research lab in Zurich has been inspiring and has placed this research center even more firmly on the scientific map. As a side note, when I moved to Zurich I lived in the small town of Kilchberg and I would often walk or run uphill past the IBM lab, which is located across the street from a farm. For me this lab still stands for a place where science can be conducted at very high levels away from the hustle of the standard academic environment. Question: What’s next for your research? RW: After having developed spin-polarized STM and applied to many different material systems, including metallic thin films and nanostructures, semiconductors and oxides, as well as single atoms and molecules on surfaces, the next step will be the application of spin-polarized STM to novel material systems, including low-dimensional carbon materials, topological insulators, and unconventional superconductors. Spin-polarized STM promises to unriddle the role of the spin degree of freedom for the fascinating properties of these novel material systems down to the atomic scale. chemical identification and atom manipulation techniques. We then investigate the properties of those clusters by AFM and STM. interaction force with the tip. as solid state quantum computers will become a reality. spin resolution and time resolution. Besides the continuing search for materials with even better and more exotic spin properties, my plan is to apply everything we have learned from our research in the past years to another class of materials, such as the high temperature superconductors — the other remarkable Nobel Prize discovery at IBM Research – Zurich.